The Barnacle Goose was @SpeciesofUK from 27th January to 2nd February, 2014. Barnacle geese are medium-sized geese with a distinctive white face and belly, and black head, neck and breast. They are Arctic geese that come to the UK for winter and congregate in spectacular fashion. Barnacle geese are ‘black’ geese. All geese belong to the bird family Anatidae which includes all ducks, geese and swans. Geese fall into three genera: Anser (grey geese), Chen (white geese) and Branta (black geese). 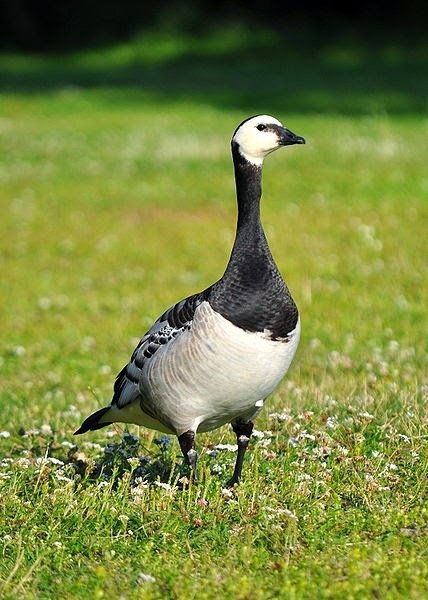 The barnacle goose is a black goose. 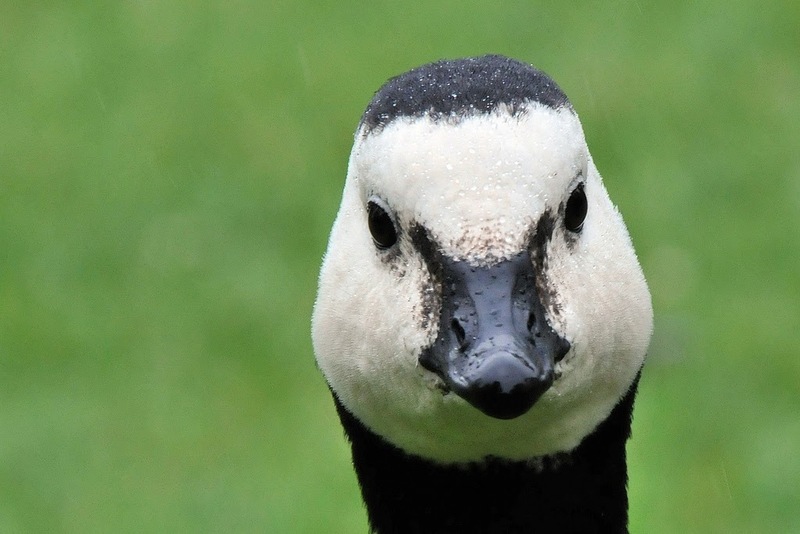 The barnacle goose shares the Branta genus with the Canada, Cackling, Brent, Red-breasted and Hawaiian geese. The black geese commonly found in the UK are the Brent, Barnacle and Canada, although the Canada goose is an introduced species rather than native. Other UK names for barnacle geese include 'cathan' (Gaelic), ‘gwydd wyran’ (Welsh) and ‘rout goose’ (Scots). 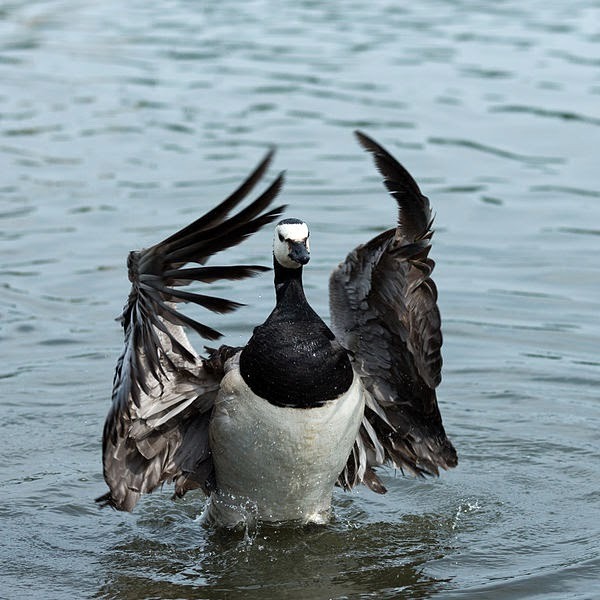 The Latin name for barnacle goose is 'leucopsis' meaning white face. 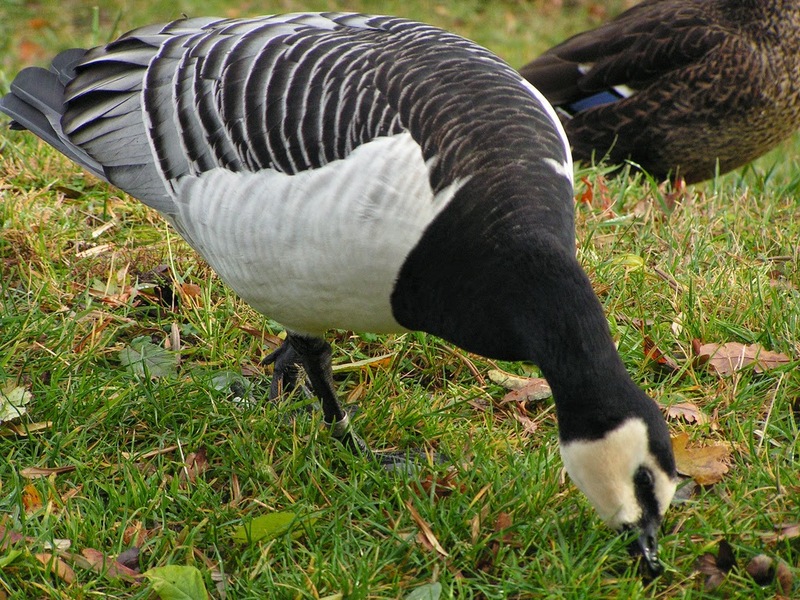 The barnacle goose has a black head and creamy white face. It shows a marked contrast between its black neck and white belly. Barnacle geese also have a lovely bluey grey barred back, and a black tail. 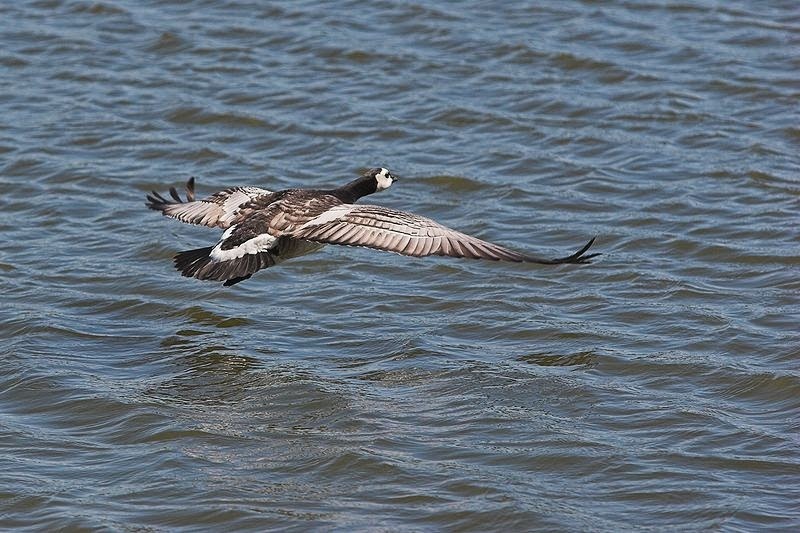 During flight, the barnacle goose has a distinct V-shaped white rump patch and silver-grey underwing linings. 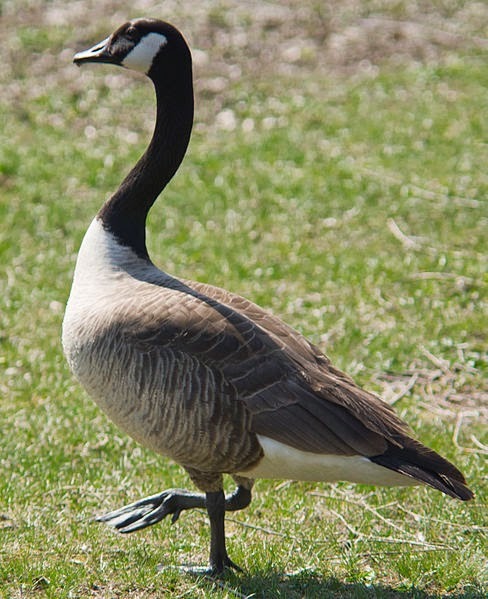 For comparison, here is the closely-related Canada goose. It’s much greyer than the barnacle goose, but has a similar black neck and head. Barnacle geese breed in the Arctic. Barnacle geese breed mainly on Arctic islands in the north Atlantic. There are three main populations: Novaya Zemlya which winter in the Netherlands; Greenland which winter in Ireland and Islay; and Svalbard which winter on the Solway Firth. After their young hatch, barnacle geese spend a flightless month moulting in July or August at sites near the breeding grounds. Then they start their migration. 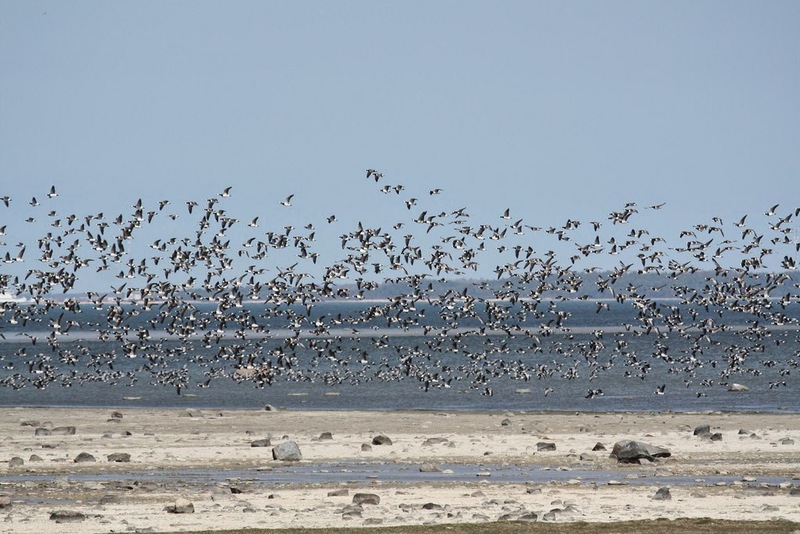 Barnacle geese migrate via regular stop-over sites, south to their wintering grounds, arriving in late September. Around 94,000 come to the UK for the winter, most staying on the Solway Firth and the Scottish island of Islay. A small number (less than 1,000 pairs) stay during the summer to breed. 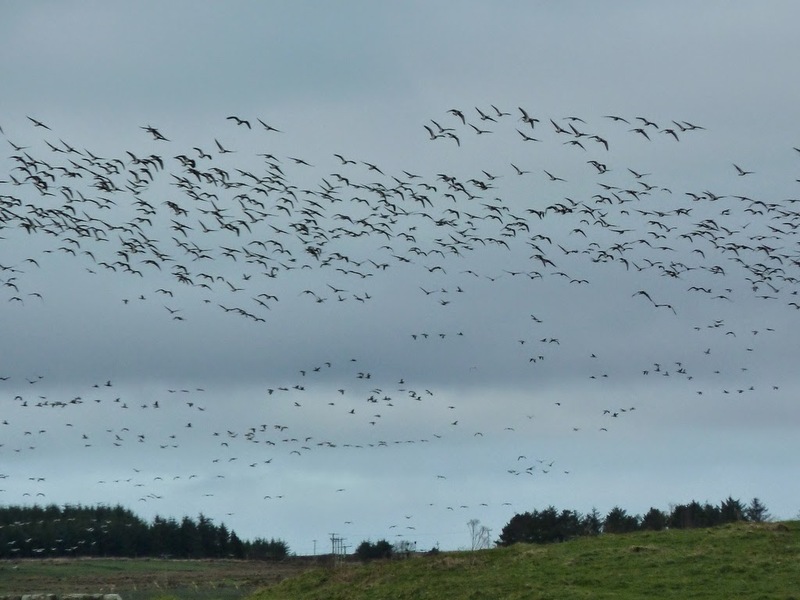 The arrival of up to 35,000 barnacle geese on Islay is one of the wildlife spectacles of the UK. Barnacle geese come to Islay to feed on the grassland and take refuge on the mudflats. 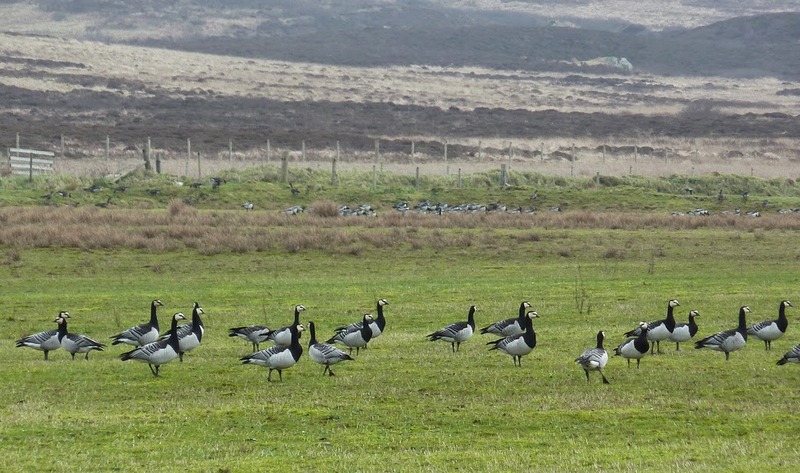 Barnacle geese boost Islay's tourism but devastate its farmland. Scottish Natural Heritage pays Islay farmers and crofters £400k each winter to compensate them. Here is a video of Islay's geese. Just listen to the sound of all those birds. Barnacle geese are highly sociable. They fly in packs or long, loose lines. They make a noisy chorus of barks and yaps. 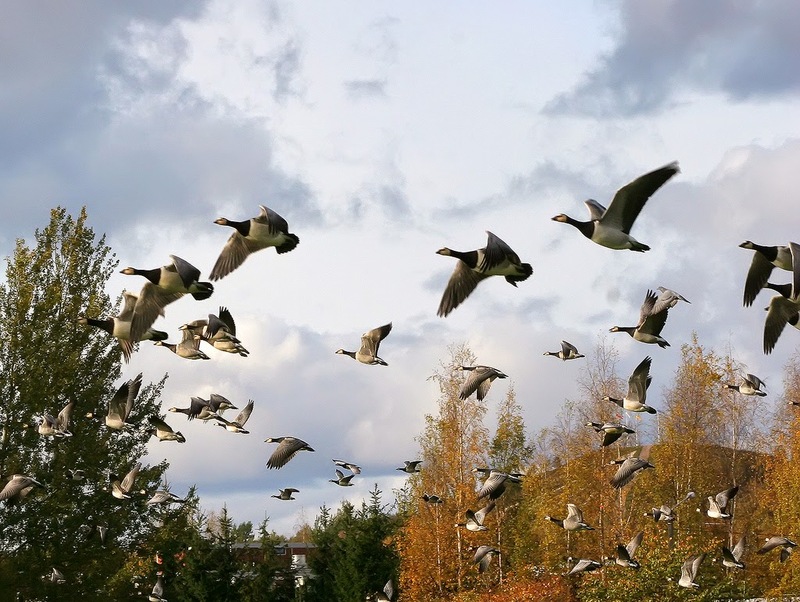 When in flight, a group of geese is called a 'skein.' On ground, they can be called a 'gaggle' but 'flock' is fine too. Here’s some samples of typical barnacle goose calls. The barnacle goose is a herbivore. They eat the leaves, stems and seed-heads of grasses, sedges, aquatic plants, mosses and herbs. During the winter, barnacle geese also eat agricultural grain and vegetables. Barnacle geese breed in Arctic semi-desert tundra. They nest on crags, outcrops and cliffs (as protection from predators), within reach of wetland. 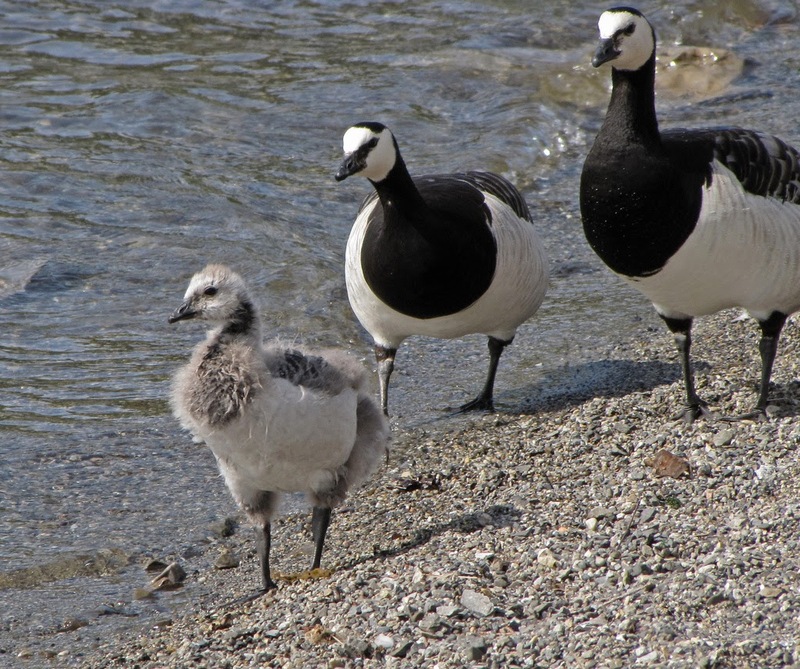 Barnacle goose nesting sites are used year after year, accumulating nesting materials. They sometimes nest among seabird colonies. Barnacle geese have one brood a year. Four or five eggs are incubated for twenty-five days. The chicks fledge after forty to forty-five days. Like all geese, barnacle geese bring their goslings to the food not the food to the goslings. 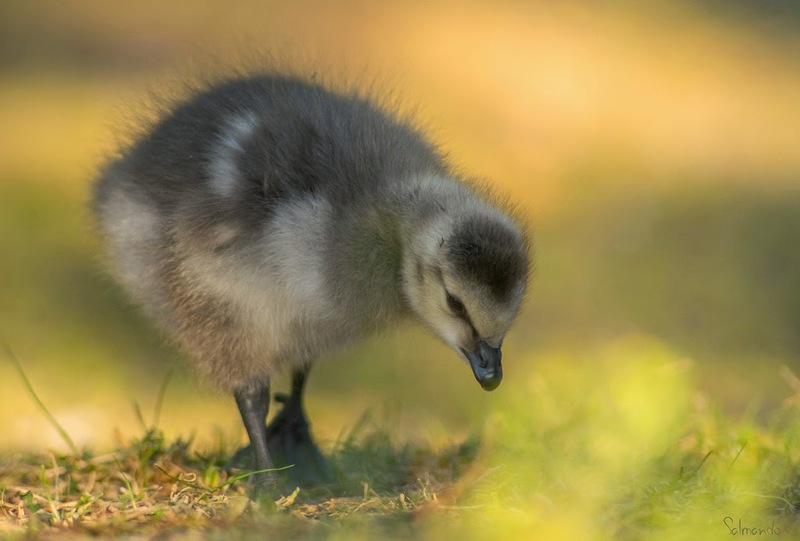 At just three days old, before they can fly, barnacle goslings perform an daredevil act as they jump and tumble down from their cliff top nests, protected only by their down. Take a look at an amazing video of barnacle chicks leaving the nest. Some barnacle goslings sadly die or become injured on their way down from the nests and become prey to predators like Arctic foxes. After the young hatch families may disperse away from rocky ground to more vegetated areas surrounding tundra lakes and rivers. Here's a neat video of a young barnacle gosling, already mastering feeding by itself. Barnacle geese typically live for around fourteen years. The oldest recorded was twenty-six years. 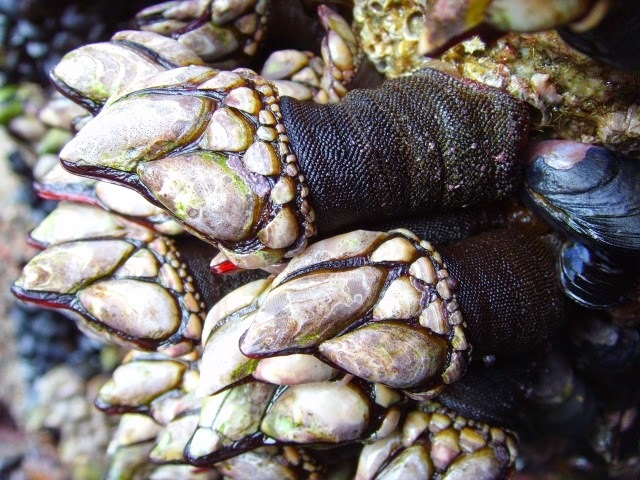 Barnacle geese were once thought to start life as goose barnacles growing on driftwood, because no-one had seen them nest and people didn’t know they flew to the Arctic to breed. Because barnacle geese were thought to be born of driftwood, some Irish clerics advised their meat could be eaten on fast days. In response, the Pope explicitly prohibited the eating of barnacle geese during Lent, arguing that despite their unusual reproduction, they lived and fed like ducks.